My M/19 Puukkopistin collection to date. These were designed by the famous Finnish artist Akseli Gallen-Kallela. Originally they were part of the dress uniform for NCO from the rank of Sergeant First Class - Sergeant Major. since they did not wear swords. Often they are referred to as aliupseerin puukkopistin. The original M/19 were longer. In 1922 they were made shorter. Often collectors refer the the shorter puukkopistin as the M/22. At first all had knurled metal handles. A smooth wood handle version came later. The wood handle model were worn by Corporals - Staff Sergeant. These were so popular that eventually they were worn by the Civil Guard and Police Officers as well. Even Private 1st Class were allowed the smooth handle version. The puukkopistin were purchased with the uniform by individuals. They were not issued by the Army or Civil Guard. 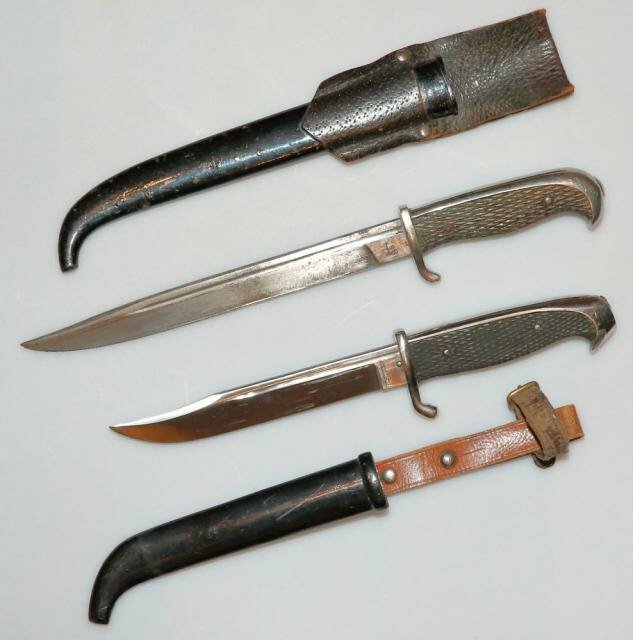 Though they started off as a dress knife they were eventually used as an everyday puukko for for both fighting and general use. All of mine are the Short M/19 version commonly called M/22. They are a rare find. I have yet to see a M/19 Long Version for sale which are ultra rare. I did see one full rig with the tassels for sale but those are very rare as well. Pictured below From left to right Hackman Knurled, Hackman Smooth Wood, Eickhorn, Coppel, WKC, and Hörster. Only the Hörster is unmarked. All are slightly different especially at the pommel where the false button is. Still looking for a Fiskars Knurled and Smooth Handle and a Kotshack. Thanks for sharing, Wow this forum has so much interesting stuff. I have a nice US collection but can not make heads or tails of these knives. If we were at a garage sale together and these knives were on the table , you would be buying them while I am looking through a box of sockets . checkmate19 wrote: Thanks for sharing, Wow this forum has so much interesting stuff. I have a nice US collection but can not make heads or tails of these knives. If we were at a garage sale together and these knives were on the table , you would be buying them while I am looking through a box of sockets . If you ever find a short one for less than $400 grab it. A long for under $800 grab it as well. Last short I saw sell here was on ebay for $600 and gunboards before that for $450. Here are some long and short side by side. Found pics on a Russian language forum. Notice the long usually has the rings on the scabbard, but not always.